In a world of pastel colors, pink skies and aqua marine waves, a female figure glides effortlessly on her surfboard. The woman is 6-times world champion Stephanie Gilmore. The universe is that of Japanese artist Masanobu Hiraoka. The result is a mesmerizing plunge into a dream-like universe. The unexpected partnership stems from an encounter between Stephanie Gilmore and Masanobu, joined by a shared love of the art and movement. True to Masanobu’s style, the stunning visual interpretation called for a soft and enthralling soundtrack. With this in mind, Stephanie Gilmore reached out to Los Angeles based musician ASKA to imagine a musical universe to mirror Masa’s creation. The soundtrack fuses warm notes of electric guitar and reverberating sounds, evoking the echoes of the underwater world. When it came to interpreting the musical inspiration, Stephanie – a long-time guitar player – was up to the task. The project was supported by ROXY, a brand dedicated to empowering women through action sports and creativity, and Stephanie’s sponsor for many years. “Surf and art have always mingled: there is a shared sense of joy and creativity in these two mediums. 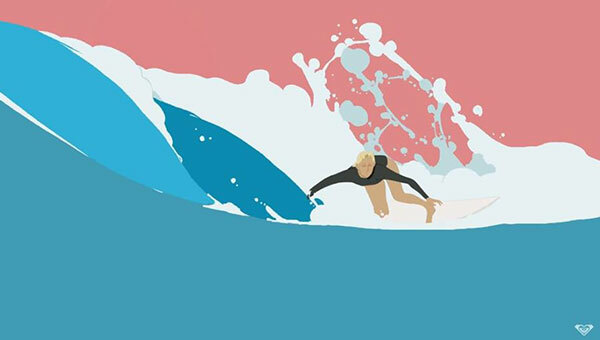 The realization of the most stylish surfer in the world interpreted by an artist at the forefront of his medium is a beautiful expression of such a feeling.” – Danielle McKenzie, Global Marketing Manager, ROXY. Tokyo-based filmmaker, Masanobu Hiraoka has earned a cult- like following with his short animation movies. He organically blends fantasy and natural forms in a symphony of liquidity. The self-taught artist owes his popularity to a masterful command of color paired to dreamlike soundtracks. A key figure of the Los Angeles music scene, ASKA is a classically trained pianist, a musician and a composer. In 2010, a collaboration with movie director Spike Jonze opened her eyes to the world of film scoring. She has since then dedicated her career to the creation of soundtracks for shorts, feature films and series. ASKA believes music is the purest form of expression, one free of geographical limitations.